Solo albums can be a funny thing. Often times a lead singer who strikes out on his or her own can be desperate to fashion a new identity and reclaim their voice as an artist. This new identity can feel so far removed from their old band, maybe a hypothetical band that you loved dearly, that you question whether you can support this singer’s new quest for independence or whether you need to bury your head in a stack of old LPs and remember the good times. Hamilton Leithauser, the former frontman of a band that I happen to be enamored with, stands in direct opposition to this artistic pitfall: his new album doesn’t just showcase the raspy, smoke-filled croon I’ve come to love, it shows the development of an artist that I’ll happily continue to follow. Leithauser stopped by LUNA music back in September during the Indianapolis leg of his tour with Spoon to perform some stripped down versions of songs from his new album, Black Hours, for our Laundromatinee.com project. 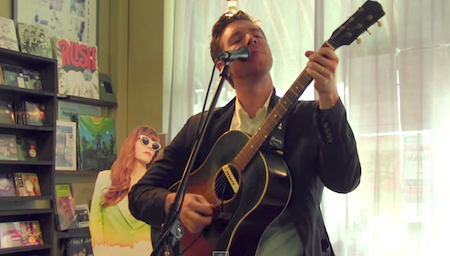 Jumping between the seam-bursting energy of “Alexandra” and the sweetly melancholy “11 O’clock Friday Night,” Leithauser played to a tightly packed, intimate group at the shop as if in front of an audience at a sold out club. After the final song the crowd pushed forward to talk with Leithauser, who graciously shook hands with each member of the crowd who waited for him. This kind of enthusiasm and kindness bodes well for the new identity Leithauser is forming, and the size of the crowd makes me think he’ll have quite a sizable following throughout this new stage in his career.